It's not that I think this book wouldn't be good for some kids but here is the lens through which I view picture books: I am a children's librarian, living in a culturally diverse city. I am also something of a feminist, and opposed to an overabundance of pink. Would I read this to a group of children of mixed races, religions, and family situations? Nope. It's one thing to have a message that teaches what it's like to be from a certain culture, it's another for me to read a clearly WASP oriented book to a diverse group of kids. I don't think it was poorly written. It's just not for my audience. This story has a sweet spirit about it. The illustrations are super cute, however, the way Gigi speaks is a little too grown up. And you almost have to read the earlier books to keep up with Gigi's train of thought. Aside from that, it still makes you giggle and want to walk around in a pink tutu. Entertaining reminder that we are children of the king. I read this book to my granddaughter during her visit this summer. It's a sweet story about a sweet little girl who is so excited to share some wonderful news with her friend. The illustrations are adorable. Madeline and I both loved it. It seemed like I came in on the middle of the story. 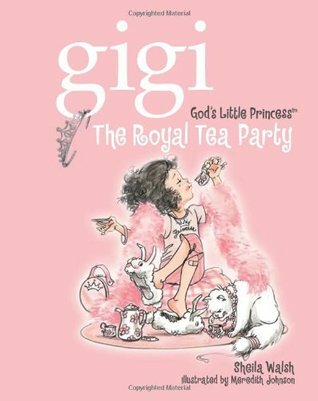 I haven't read any of the other Gigi books and maybe this is one of those series that you must read in order.I did love the message though and the story as it plays out is rather cute. I wasn't aware that this was Christian fiction when I did a library loan on it for a tea party program. The fact that it is Christian fiction is not the issue. The problem is that it's a silly, didactic bit of nonsense. The plot is weak, the text lengthy, the result verging on ridiculous. This was the girls' favorite tea-related storybook. Bailey had me read it over and over.